If you’re visiting San Diego, chances are you’re going to want to go to the beach. Why not take things to the next level and stay right by one of San Diego's best beaches? San Diego has a plethora of hotels that are located next to the sand. Some are adjacent to boardwalks, some involve stepping from the hotel patio directly onto the sand, some are small hotels and some are massive resorts, but they all have one thing in common: stunning views of that sweet San Diego surf. If you want to maximize your time sunbathing and wave watching in San Diego, rest your head at a beach hotel. Here are the best oceanfront hotel options in San Diego broken down into more specific categories depending on exactly what type of accommodation you’re looking for. La Valencia Hotel has been a staple in La Jolla since 1926, and it’s an attention-grabbing one at that thanks to its pink exterior, which has resulted in the nickname The Pink Lady thanks to its color and historic elegance. Inside all that pink, you’ll find luxuriously appointed rooms, many of which have views of the La Jolla Cove and overlook La Valencia’s relaxing terracotta-tiled patio that has a sparkling oceanview pool. Stay on the other side of the beach at Crystal Pier Hotel and Cottages. How does that work? Because this hotel is built right on top of the Pacific Beach Pier and you’ll literally be sleeping over the ocean. Each room is actually a tiny little cottage and you’ll have views of the beach and the wide open ocean from the windows. It’s a pretty cool experience. Just keep in mind the pier is open to walkers from 8 a.m. until sunset and you’ll be in Pacific Beach (PB) so it may be loud at times – luckily the sound of the crashing waves will help to muffle a raucous passerby. If you like your hotels to feel fun and trendy with a hip element or two thrown in, Tower23 is calling your name. Located in Pacific Beach, which is slowly moving beyond just dive bars and beach clubs, Tower23 is still the original place to head when you’re looking for an upscale break from the bars of party-hearty Garnet Street in PB. Platinum coloring with mood lighting greets you in the lounge. The rooms are light-filled and have balconies or patios. There is also a rooftop sundeck with lounge chairs for guests to enjoy. This historical hotel is one of San Diego’s most prominent landmarks thanks to its whitewashed façade and red-orange roof. Oh, and it has some of the best real estate around, facing the long, wide, pristine beach. 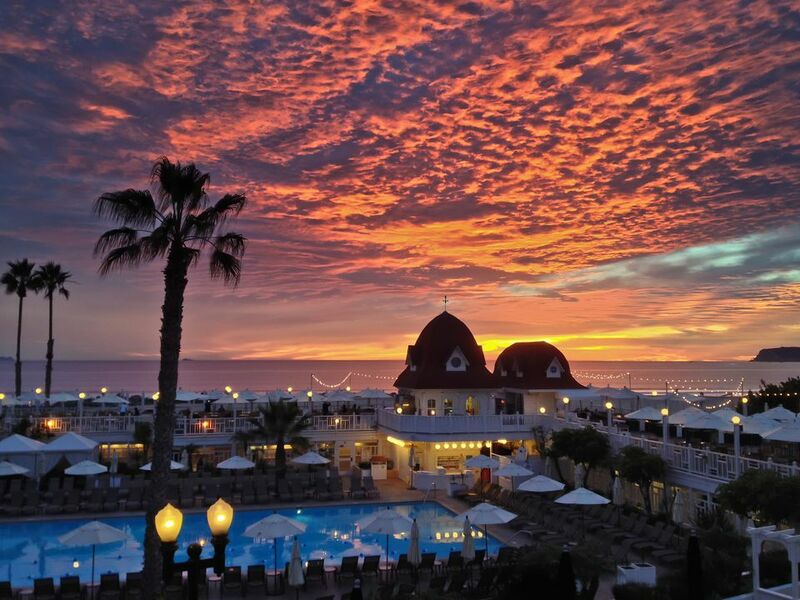 Hotel Del Coronado, or just the Hotel Del as it known to locals, has 5-star onsite dining, a myriad of bars with different views, a spa and upscale shopping and a fabulous pool area. It has an interesting history, complete with haunted rooms, which you can learn more about during your stay (book early if you actually want to stay in one of the haunted rooms, they typically book up fast). There are immaculately groomed grounds with ocean views – some of which is even covered by a fantastic ice skating rink in December, though it’s a memorable stay no matter what time of year you go. Blue Sea Beach Hotel is located south of Garnet Street in Pacific Beach, providing a short walk to the bars and clubs of PB or a short, cheap taxi or Uber ride to the laidback bars of Mission Beach. Blue Sea Beach Hotel was recently renovated and has décor with crisp lines and soothing blues reminiscent of the outside sea. There is also a heated pool (perfect for evenings when the ocean breeze makes things cooler) overlooking the sand and sea. With a central outdoor pool area which the rooms wrap around and quick access to the beach (the back entrance of the hotel is right on the sand), the La Jolla Shores Hotel is an excellent stay for a laidback family vacation. You’re also right by the many activities offered at La Jolla Shores beach including kayaking, snorkeling, surfing and more. There is also a delicious on-site restaurant and bar with large windows overlooking the surf. You’ll probably want to leave to take the kids to the San Diego Zoo and Balboa Park, but otherwise, you may never want to leave this family-friendly resort on Coronado. With a fabulous beachfront that overlooks the bay onto the downtown skyline and Coronado Bridge, several onsite restaurants and bars, kid camps during most of the year and a variety of suite rooms to give families more space, it’s an oasis for families in one of the prettiest parts of San Diego. The location of this hotel has an interesting past. The original hotel on the site was built in 1910 and was often visited by big movie stars of the time who were usually down in Del Mar to attend the horse races. After the old hotel fell into disrepair, it was torn down and a new, luxury one was built in 1989 (and impressively renovated in 2008) and it still has a connection to the horse track, since its popular Opening Day After-Party still takes place there each year. L’Auberge Del Mar also has a stunning pool area, opulent spa and is right next to Del Mar’s charming downtown called Del Mar Village. The Inn at Sunset Cliffs is located right by the golden brown cliffs of the same name sandwiched between Point Loma and Ocean Beach that gorgeously jut up from the ocean floor while the waves crash against them below. The Inn at Sunset Cliffs has terraces and a pool overlooking this beautiful scenery, while inside you’ll find a pleasant lobby and a variety of differently outfitted rooms including ones with kitchenettes. Scripps Inn in La Jolla is right by the ocean but situated up on the cliffs a bit, which means it’s still a little walk down to the beach, but the panoramic ocean views are incredible. There’s a relaxing lanai overlooking the sea and the rooms are bright and decorated in peaceful sea tones with charming tables, chairs, and beds that look perfectly fitting for a beach house. The nightlife in Ocean Beach (OB) is a bit more chill and funky, and it is ideal for those looking to get some local flavor while staying in San Diego. Stay at the Ocean Beach Hotel for easy access to the restaurants and nightlife of OB while enjoying direct views of the sandy beach and OB Pier. Parking comes at a premium in OB, but Ocean Beach Hotel provides free parking. It also has pet-friendly rooms available. This option gives you relaxation and nightlife. You’ll be staying in the peace and quiet of Paradise Island, which you can enjoy during the day and once you’re ready to go to sleep, but will have easy access to the fun beach bars of PB thanks to the Bahia Belle, a turn of the century Mississippi Sternwheeler ferry that runs in between the Bahia Resort Hotel and its sister hotel in PB, the Catamaran Resort Hotel and Spa, most evenings. You may even find yourself having so much fun on the Bahia Belle that you don’t want to get off the ship – and you don’t have to until the end of the night since the $10 ticket lets you ride back and forth between the two hotels as much as you want (although if you’re staying at the Bahia Resort Hotel then riding the Bahia Belle is free). The Manchester Grand Hyatt is more waterfront than beachfront since it’s right by San Diego’s beautiful harbor, but if it’s water views and nightlife you mainly care about, it still may be your best bet even without sand super close by. Plus, thanks to its Top of the Hyatt bar (located on the 40th floor), you can pretty much see all the coastline stretching from downtown San Diego, beaches included. The Manchester Grand Hyatt is also within walking distance or a short cab ride to some of San Diego’s hottest nightclubs, including Omnia and Fluxx. Wyndham Oceanside Pier Resort has clean, modern furnishings and a streamlined aesthetic plus a pool and wide ocean views. It’s located directly across from the Oceanside Pier which makes for a gorgeous walk (take a break at Ruby’s Diner at the end of the pier for an old-fashioned milkshake) or you can opt for walking with your feet in the sand upon the miles of golden coastline stretching from either side of the pier. The restaurants and bars of downtown Oceanside are also within walking distance. Beach Terrace Inn isn’t just oceanfront; it’s located directly on the sand in Carlsbad. You can literally walk from the pool down a few steps and be right on the sandy beach with the waves of the ocean right in front of you. Kids will love the triangular pool at this hotel while adults will love that it’s close to the Carlsbad Village for easy access to dining and shopping. Located along the western edge of Mission Beach Boulevard in Pacific Beach, the PB Surf Beachside Inn provides great rates for a hotel right by the sand. The rooms are nicely furnished with sea-inspired décor and mini fridges. Though you won’t find direct ocean views from the hotel, you’re literally 30 seconds away from a walk to the waves, which is hard to beat at the price. With rates typically under $200 during high season, you won’t find this hotel right on the beach, but you’re still just a five-minute walk from the coastline and a 15-minute walk from popular surf spot, Tourmaline Beach. The Sands of La Jolla is located in the Bird Rock neighborhood of La Jolla, providing close proximity to a variety of upscale yet eclectic shops and restaurants plus is close to the action of Pacific Beach.